You'll explore the less-touristy side of things at Agincourt Reef and Balloon Rides. Explore Cairns' surroundings by going to Cape Tribulation (Daintree National Park & Daintree Rainforest - Cooper Creek Wilderness), Photography Tours (in Daintree) and Kuranda (Terra Nova Gallery, Barron Falls, & more). Next up on the itinerary: let little ones run wild at Muddy's Playground, don't miss a visit to Captain Cook Highway Rock Stacks, look for gifts at Australian Leather Company, and take in the architecture and atmosphere at St Monica's Cathedral. To see photos, more things to do, other places to visit, and tourist information, you can read our Cairns journey planner . London, UK to Cairns is an approximately 23.5-hour flight. You'll lose 10 hours traveling from London to Cairns due to the time zone difference. Plan for a bit warmer temperatures traveling from London in September, with highs in Cairns at 33°C and lows at 22°C. Wrap up your sightseeing on the 30th (Mon) early enough to travel to Sydney. Eschew the tourist crowds and head to Kiama Blowhole and Wentworth Falls. You'll find plenty of places to visit near Sydney: Blue Mountains National Park (Lincoln's Rock, Anvil Rock Lookout, & more), The Giant Stairway (in Katoomba) and Shelly Beach (in Manly). Dedicate the 4th (Fri) to wine at some of the top wineries in the area. There's still lots to do: get up close to creatures of the deep with a dolphin and whale watching tour, take in the spiritual surroundings of St. Mary's Cathedral, trek along Manly Scenic Walkway, and get some thrills on the water with a speed boat tour. For ratings, photos, traveler tips, and other tourist information, read our Sydney trip planner . Traveling by flight from Cairns to Sydney takes 6 hours. Alternatively, you can drive; or take a train. Expect little chillier temperatures when traveling from Cairns in October; daily highs in Sydney reach 28°C and lows reach 17°C. Wrap up your sightseeing on the 6th (Sun) to allow time to travel to Melbourne. 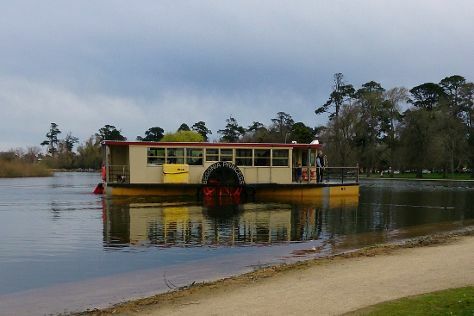 Discover out-of-the-way places like Lake Wendouree and Healesville Sanctuary. Venture out of the city with trips to Hepburn Lagoon - Trail Rides (in Hepburn Springs), Daylesford (Lake Daylesford & Spas) and Ballarat Botanical Gardens (in Ballarat). There's still lots to do: get in on the family fun at A Maze'N Things, take in nature's colorful creations at Fitzroy Gardens, step off the mainland to explore Churchill Island, and tour the pleasant surroundings at Werribee Open Range Zoo. For where to stay, reviews, and tourist information, use the Melbourne online trip itinerary maker . You can fly from Sydney to Melbourne in 3.5 hours. Other options are to do a combination of flight and shuttle; or drive. Traveling from Sydney in October, things will get a bit cooler in Melbourne: highs are around 24°C and lows about 9°C. On the 13th (Sun), wrap the sightseeing up by early afternoon so you can travel back home.